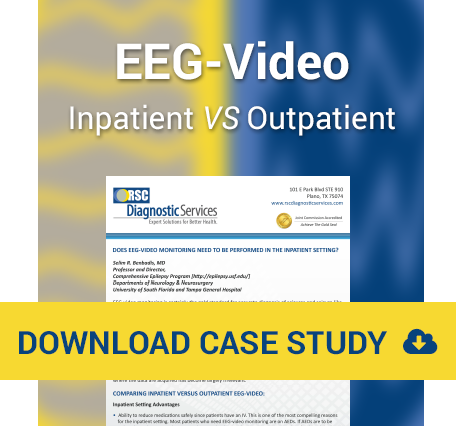 What is an Ambulatory Video EEG? EEG is the abbreviation for electroencephalogram. An EEG measures the electrical activity of the brain and is performed to see how the different parts of your brain function. The brain’s electrical activity fluctuates from second to second, but routine EEGs provide only a 20-40 minute sample of this activity. If epilepsy waves occur in your brain only once every 3 or 4 hours, or if they only happen certain times of the day, a routine EEG might not record them. During Ambulatory EEG monitoring, comprehensive EEG data is recorded which enables your doctor to observe your EEG over a prolonged period of time. Ambulatory EEG monitoring can help diagnose your seizure type or symptoms and provides important information. The purpose of the Video is to be able to see exactly what is happening when you have a seizure or event and compare the picture to what the EEG records at the same time. It is important to be on camera as much as possible, even when sleeping. Sounds that occur during the testing are also recorded - this can pick up if a person talks or makes any other sounds during an event. By doing this, doctors reading the EEG can tell if the seizure or event was related to the actual electrical activity in the brain. How is Ambulatory EEG different from the Routine EEG I had done in my doctor’s office? Typically, 20-90 minutes worth of data is gathered from Routine EEGs or Awake and Sleep EEGs. Ambulatory EEGs gather 24-120 hours of data which means that we have all the more potential to capture an actual seizure/event as well as any abnormalities. In addition, a big benefit to AEEG is capturing a patient's sleep pattern. The transition a patient undergoes from awake to drowsy to asleep is where most abnormalities are seen. This is just another way for your doctor to get more answers to help their understanding of your condition and improve your care and treatment. 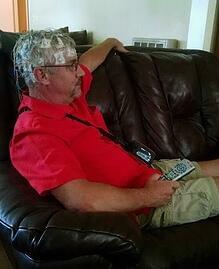 Why do I need an In-Home Video EEG? The brain’s electrical activity fluctuates from second to second, and routine EEGs provide only a 20-40 minute sample of this activity. If epilepsy waves occur in your brain only once every 3 or 4 hours or days, or if they happen only after an hour of sleep, for instance, a routine EEG will usually be normal. As a result, the doctor may want to see a longer recording that includes prolonged periods when you are both awake and asleep. 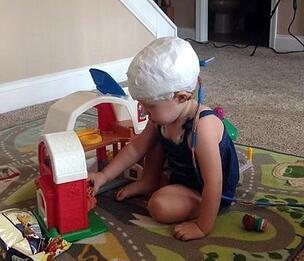 This kind of recording is called an ambulatory EEG or a prolonged in-home video EEG. RSC uses lightweight equipment, and patients are free to move about their homes without restrictions. It is important that the patient follows the instructions provided by the technician to avoid compromising the results of the study. The equipment weighs approximately 1.2 lbs and is smaller than an average tablet. How long until my doctor gets the results of my study? It will take 3-5 business days for your ordering physician to get your study results. What should I expect once I am referred to RSC? Learn everything you need to know about your study here.